Mention the word Levi’s and most people will probably think about their pair of beloved denims that seem to virtually outlast just about any article of clothing they have ever owned. Well, Levi’s is certainly keeping up with the times, and their latest product is not yet another kind of cut for a new pair of jeans, but a cellphone instead. 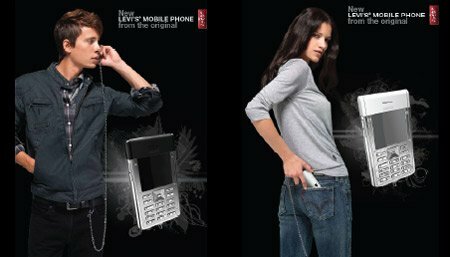 Yes, ModeLabs Group has just announced the first Levi’s cellphone in Hong Kong – and I wonder how the handset’s sales would do in a territory where folks seem to change their cellphones far more often than their underwear. A dynamic city like Hong Kong apparently loves glitzy launches, and the Levi’s cellphone launch certainly drew a whole lot of attention, which is always a good thing. Hong Kong is often seen as the “forerunner in fashion and technology trends in China and, more globally in Asia”. This new handset will be made available in around forty points of sale of the city’s main names (e.g. The Levi’s Store, Broadway, City Call, PCCW, and Show Room CSL); and to date, several thousands of phones have already been ordered – guess folks have plenty of faith in what Levi’s has to offer despite the company being far more famous for their jeans and clothing line than anything else.